Whose network effect is greater, Uber or AirBnB? Waves of innovation, from Microsoft’s software, to Facebook and Google’s cloud products, to today as firms refer to their potential digital disruption as “Uber moments” — have all been sped by strong network effects. However, not every platform-based business consolidates its marketplace and achieves this advantage. Some markets seem relatively immune to the kind of rapid growth and consolidation. Network effect varies between marketplaces. Consider the enterprise content management space, which in spite of network effects that CMS platforms should have, a vexing number of CMS providers persist. Making the choice of which CMS system to select a specialty for boutique consultancies. Of late I’ve noticed a plethora of messaging apps, and possibly a lack of consolidation in conferencing software. So, that raises the question, who do some markets and firms experience profound network effects while others seem immune? 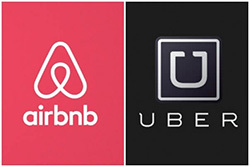 Uber and AirBnB are widely recognized innovators. By thinking about how each gains advantage through network effect, I hope that we can get beyond simply recognizing the strength the impressive business growth of these firms, to appreciate how circumstances enable or inhibit this dynamic. Every phase of Internet evolution has in-part been driven driven by the powerful influence of network effect. The defining benefit of a network effect is that the value of a network grows with each new participant. In the case of Microsoft, the more users its software gained, the easier it was for them to gain enterprise accounts, sell more of software and in turn generate still more valulable users. Likewise, as Facebook was popularized beyond a few colleges, its members experienced greater reach to connect and be seen by larger audiencdes. Network effects create disproportionate benefits for leaders who consolidate what become winner-take-all markets. So which business seems better positioned to benefit from network effect: AirBnB or Uber? I’ve identified three factors which potentially create stronger network effects. Each should be familiar to people who bring products to market. They are digitally applied versions of factors that have always driven business success: dynamics of scale, customer persistence, and the ability to build a company that improves. I’d propose that these well-recognized factors may be starting points to assessing what drives stronger effects. In both companies, the threshold for their service to be viable is achieving service and customer density in local markets. But, I would suggest one firm faced a greater barrier to entry, which means its has a greater moat as a barrier to new competition. Both firms are operate digitally mediated markets between providers and renters. Uber needs enough drivers on its platform to provide prompt service where it operates, and an adequate ridership to keep those drivers available. As the density of drivers and riders increases, Uber’s market gains value. Likewise, AirBnB’s market also requires geographic density. The more property choices and renters they aggregate, the better and more valuable AirBnB’s market becomes. But the dynamics of these businesses favor AirBnB iby providing higher barriers n two ways. 1.) Uber is a discretely local business. Riders in Detroit mostly want rides in Detroit. In comparison, AirBnB renters seek accommodations in far flung geographies. This higher requirement of geographic diversity is a barrier of entry that makes harder for future entrants to reach a viable scale to compete with AirBnB. 2.) Uber faces a diminishing return on its advantage of scale, which ultimately is expressed in promptness. Travel customers seek a more diverse range of places to stay, so AirBnB can continue to scale both for convenient location and varied accommodation options. But Uber doesn’t have this same opportunity to scale for great variety, and there is a point at which reducing the average wait for a ride provides progressively less benefit. Both these attributes give AirBnB the opportunity to use its scale on increasingly differentiate its offerings. Companies which maintain persistent and exclusive networks of customers and providers gain greater network advantages. Markets where switching is easy and defection is prevalent will be less able to defend premium pricing. AirBnB affords a greater opportunity for hosts to differentiate themselves by creating guides, special services, or standing out in detailed reviews by renters. Once these assets have been established, they tend to lock hosts in. Uber riders and drivers don’t post extensive content, but they do have reviews. However, driver’s interactions are so numerous and are non-differentiated, they may gain an adequate reputation on multiple complimenting platforms, say driving for Uber, Lyft and the local cab company all at once. AirBnB renters are more likely to be attracted to the personality and reputation of a host, than Uber rides are to drivers. And the effort of generating this reputation may help lock-in hosts more than drivers. Uber appears more experimental with its data platform, constantly testing new price points and service configurations. Further, the demanding real time “urgent now” mindset of their users, requires design and systems to streamline a far more rapid product experience. These may add a technical barrier to entry and provide some advantage on data-driven service improvement. However, in practice, the two firms use their data to drive customer value differently. Uber’s offers tend toward discounting for bulk purchase, or use choices which more effectively use drivers by pooling overlapping riders. Uber focuses on ride volume which the promote through cost savings. This risks trading margin for increased client lock-in. In comparison, AirBnB tends to market destinations and new properties aimed at increasing their clients’ appetites for additonal travel. They market luxurious locations, and may have a greater potential to upsell rather than to discount. So, in this regard, AirBnB seems better able to stoke demand and upsell. Personally, I’m an ardent user of both firm’s services. And I don’t intend to make network effect somehow an indicator of either firm’s superiority. But comparing these peers in different industries is instructive. Others have posted about how these two disruptive unicorns go at their tactical marketing differently, such as their use of video and social networks. I’m doing a similar sort of ‘twins study’ to suggest what factors explain strong network effect. f course, this is a limited example, which I’d love you to correct or test by extending it in other situations. I’d very much like your views, and am glad to correspond and link to the insights or corrective thoughts you share. Can you think of a B2B firm’s which has achieved the kind of network power with little or no consumerer-based network power? And what of the CMS industry? Thanks for reading, and for the exchanges that follow on Twitter, email and comments here. 2 Responses to "Why Some Digital Platforms Dominate: the Drivers of Network Effect"
Impressing your article, you’re to be congratulated, thank you for the information.